Received an advance digital copy from NetGalley for review. I was a huge fan of Julie Kagawa’s The Immortal Rules, even though I was a little hesitant at first. Vampire dystopian? Really? Haven’t both those genres been beaten to death with the redundancy stick, resurrected into genre zombies, and then been decapitated with a sword dipped in the blood of a dead horse? But then I read it, and I loved it. 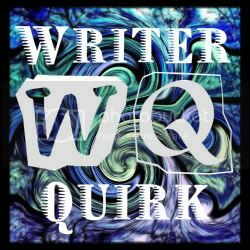 Julie Kagawa’s fluid prose, her complete willingness to dive into the nitty gritty elements of her world, and her unique spin on both the vampire and dystopian genres won me over almost immediately. 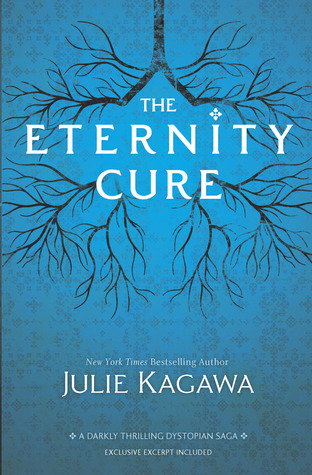 So when I saw the sequel, The Eternity Cure, was up for review on NetGalley, I requested the heck out of it. Okay, so you can really only request one way, and there is no way to make an emphatic request, but if there was, I would have done it. 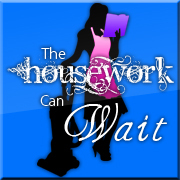 I would have strenuously requested. I’m getting away from myself here. LET’S TALK ABOUT THE BOOK. The Eternity Cure picks up a few months after The Immortal Rules leaves off, after Allie has left behind her human friends – including Zeke, the human boy she had grown to love – at Eden, the last remaining vampire-free city. Now she’s using her sire bond – a psychic link with the vampire who created her – to track Kanin, and it leads her to her former home, where she encounters a new, deadly plague, as well as some faces from her past she thought were gone forever. Just like in The Immortal Rules, Julie Kagawa does not shy away from the ugliness of her world. These vampires are not glamorous (even the glamorous ones have an ick-factor), and the world they rule is beyond grim. This is a series where I never feel complacent and I never assume that a character is safe simply because they’re important. She keeps the tension high and the action intense from the beginning through to the end, and just when I thought I might get a break — she’d raise the stakes again. Some of the secondary characters in The Immortal Rules come front and center in The Eternity Cure, which was awesome. We get to spend a good chunk of time with Jackal, the vampire prince who we last saw staking Allie and throwing her out a window. He returns, dark and snarky as ever, and walks an impressively fine line between villain and reluctant hero. Like all the best villains, he is layered and complex, and is true to himself above all else. Kanin is also back, and I love him just as much as I did in the first book. I am a sucker for the strong, noble, self-sacrificing type – provided they are not sappy and patronizing – and Kanin fills this role perfectly. He is unwavering in his morals and convictions, and they drive every action he makes, but he is also a man who has made many mistakes, and realizes they come with a price. I cannot say enough good things about his character. There should be more Kanins, both in books and in life. Zeke and Allie both come into their own a bit in this book. In The Immortal Rules, so much of their relationship was hindered by secrecy. Now, they each know up front who the other is, and have to decide whether or not to come to terms with that. I enjoyed both of them, and appreciated their increased honesty, and the closeness that came from it. I also liked seeing Allie embrace her humanity a bit more, and seeing Zeke really examine his beliefs, instead of just accepting what his father believed. There was good growth from both of them. As far as the plot, I think I’m becoming a bit immune to plot twists, because I watched everyone freak out about the twists in this book when it was released, and none of them really surprised me. BUT! That didn’t lessen my enjoyment of the book in the least – just because I suspect something is coming doesn’t mean I enjoy watching it unfold any less. So I can’t comment on how surprising or satisfying the twists are. What I can say is that the plotting is tight, the action is prevalent, and once you get to the twisty parts – she pulls no punches. NONE. AT ALL. I begin to wonder if she’s even heard of pulling punches. The Eternity Cure is a solid follow-up to The Immortal Rules, filled with intense action, thoughtfully developed and varied characters, and break-neck pacing that will keep you turning pages well into the night. Just make sure to keep the light on, because here, there be monsters. And then I finished it in three days (which for some book bloggers is still slow, but with the way my life has been lately, let me assure you that three days is about as fast as it gets). If that tells you anything. First of all, the synopsis is misleading. It implies that there is a romance in this book between Blue and Gansey, and there is not. There is a hint of romance between Blue and one of the other Raven Boys, but not Gansey. Now, I’m pretty sure that if all the foreshadowing is to be believed, the Blue-Gansey romance will come later in the series, but in this first book, there’s actually very little romance at all. This book does really well on a few fronts. First, the story itself is really interesting. The complex relationships between the boys and Blue, the intricate supernatural element that they’re exploring, and the interwoven mysteries that play out all kept the narrative moving and my attention occupied. I also really liked several of the characters, particularly Blue, Adam, and strangely enough, Ronan. I’m not even sure if I was supposed to like Ronan, but I did. Adam was definitely my favorite of the Raven Boys, and I thought the best developed. And Blue was feisty and quirky in a way that let me see how she would really fit in well with the odd group of friends. Maggie Stiefvater’s prose is engaging and flows nicely. I can see why her books are so popular (and now I’m motivated to actually go read the Shiver trilogy, which has been sitting unread on my shelf for months). One warning: This book asks some pretty big questions that are not answered in this book. One in particular that I thought for sure would be addressed before the end of the book, isn’t. It’s not a cliffhanger per se, just big questions that remain unresolved. Now I’m thinking that it will probably take the entire trilogy to get answers to some of these, but it took the entire book for me to realize the answers weren’t coming. It didn’t really bother me, but I just want you to be aware. I did have a few problems with the book that kept me from completely loving it. The first is the shifting POVs. Don’t get me wrong, I love a good multiple-POV book, when it’s done right. And for the most part, this book did it right, with one exception. The villain (of sorts) gets a voice, and while part of me loves the idea of a villain getting to tell his side of the story, I don’t think it worked in this book. It all comes back to my whole hangup with “is this voice necessary?” and his POV was used so infrequently, I didn’t think it was necessary. Interesting? Kinda. Necessary? Probably not. Yes, he lets us in on a few pieces of information we wouldn’t have had otherwise, but I don’t think the story would have suffered without them, or if we had learned them through another method. Then there’s the fact that I just didn’t really feel connected to Noah or Gansey, and I’m not sure why, but this story really needed me to have a connection with both of those characters to fully succeed. This just might be a problem with my brain, because I haven’t heard of anyone else having this problem. But bottom line, I felt like I really should care about these characters, and I didn’t. Not too much. I didn’t dislike them; I was just sort of apathetic towards them. Now, will that apathy keep me from picking up the sequel? Definitely not. As I mentioned before, I loved some of the other characters, and the story is fascinating. So while I may not have thought the book was perfect, I still thoroughly enjoyed it. 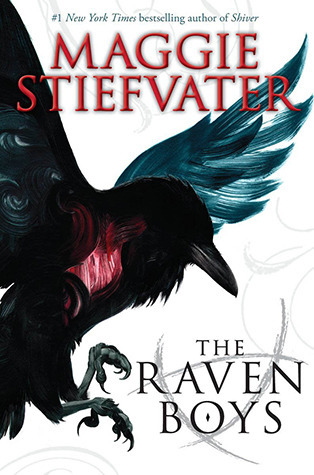 I will be eager to pick up the next one when it comes out to see what happens next with Blue and the Raven Boys. Perception, by Kim Harrington, is the sequel to Clarity, which I reviewed (and enjoyed) here. Clarity was a quick, fun read, and I jumped right into Perception the moment I put it down, anxious to hear about more of Clare’s psychic mystery-solving shenanigans. 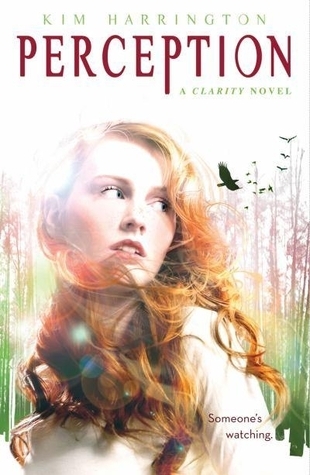 Clarity “Clare” Fern, teen psychic, is adjusting to her newfound social acceptance after using her powers to help solve the murder of a teenage tourist over the summer. Her ex-boyfriend, Justin, has made it clear he’d like to start over, and she’s also being pursued by the dark and smoldering new detective’s son, Gabriel. In addition, the girls who previously shunned her at school are now clamoring to be her friends, with the glaring exception of arch-nemesis mean girl, Tiffany. But as the school year starts, the air is abuzz with gossip about the recent disappearance of a girl no one really knew. Did she run away? Or was she taken? Meanwhile, Clare starts receiving notes from a secret admirer, and Justin and Gabriel swear it’s neither of them. Clare decides to dust off her detective skills again: to discover not only what’s happened to the missing girl, but to unveil the identity of her mysterious suitor. Much like Clarity, Perception is an exciting, fast-paced teen mystery channeling the essence of Veronica Mars, but with psychic powers. (P.S. If you’ve never watched Veronica Mars, you really, really should). The love triangle between Clare, Justin, and Gabriel is still a huge part of the story, even moreso than in Clarity, since the secret admirer plot line obviously places a lot of attention on Clare’s love life. I still see why she’s torn between the two of them and why the choice isn’t obvious, but I am happy to report that she does make a decision by the end of the book, and that it makes sense. Clare was still smart and sassy, although occasionally painfully oblivious. She suffers from severe tunnel vision in some instances and misses some pretty big clues, but overall she was still an enjoyable character. And after all, she’s not really a trained detective, so it actually makes sense that she wasn’t picking up on everything. Justin and Gabriel didn’t grow a whole lot from the first book. I still liked them both, but didn’t gain a lot of new insight into either of them. Yes, we learn a couple new things, but my opinion on both of them remained pretty much unchanged. It would have been nice to peel back a few more layers. But since I liked them in Clarity, I still liked them here. The character who changes the most is Clare’s brother, Perry. The events of Clarity hit him the hardest, and it’s sad to see what has become of his character. While on the one hand, he is no longer the flippant womanizer of the first book (which is a bonus, in my eyes), his new personality isn’t much of an improvement. I still like him, in spite of his flaws, but he wasn’t a “fun” character in this book (and he wasn’t supposed to be). I actually really appreciated that the huge developments in Clarity didn’t just roll off his back, and that he needs to take time to process and overcome them. As for the mysteries, I was a little less satisfied in this book than in the prior one. I felt like the clues were more obvious, and I’d figured out who the bad guy was really early in the story, despite a red herring that practically jumped up and down and screamed, “LOOK AT ME! I’M A RED HERRING!” It was still engaging and entertaining to solve the mystery alongside Clare, but didn’t have the same impact that the first book did, in my opinion. Overall, I really enjoyed this follow-up to Clarity, and would be interested to continue reading about the mysteries that Clare solves. Content guide: Contains violence, profanity.